A hilarious new Lightning Strikes story featuring characters from Going for Broke and The Big Dig. I joked at the beginning of September that Christmas decorations would be in the shops soon, well this isn’t Christmas decorations, but it is ABOUT Christmas decorations. Here in Australia not too many people go ‘all out’ decorating their houses and front yards for Christmas, but in certain streets where they do, you can tell that there may be some degree of competition occurring, and the house that doesn’t participate tends to really stand out. In Gardiner Street the house that doesn't participate belongs to the Foley family. Nathan's Mum can't comprehend what the neighbours are thinking....haven't they heard of Global Warming? The plan this year was for the family to go far away and have a nice family decoration free Christmas, but when their plans change, and Nathan suddenly need to earn some money for his holidays, the only option is to go all out and win the local Christmas Lights competition. As you can probably imagine, things don't go quite to plan. It's difficult for three young boys to make a winning Christmas display from an old gnome, a hobbyhorse reindeer and two strings of coloured lights. Luckily there is good community spirit on Gardiner Street, and the neighbours all pool together to round up all of their spare Christmas bits and pieces for the boys to use. All of this effort still might not be enough, so the boys rely on some modern technology to ensure their display gets the most votes in the People's Choice category, and in the spirit of all good slapstick comedies, things go horribly, but hysterically wrong. 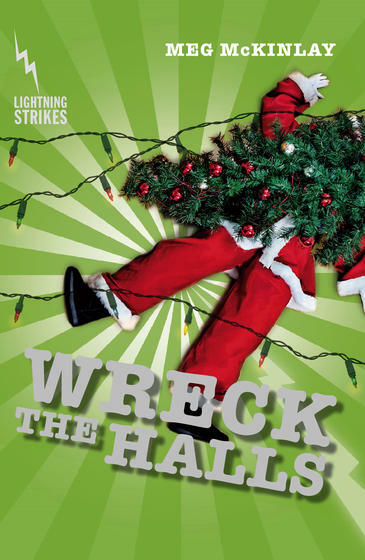 During this year I have become a big fan of the Lightning Strikes books, and this title didn’t disappoint. It's funny, quick to read and this story has a real sense of team work and community spirit and thoughtfulness, that shines through all the hilarity.